I decided to brine some chicken and test the smoking capability of my weber kettle and I was impressed. The end results: beautifully colored, crispy skin, juicy, tender and flavorful. We are barely moved in. Literally boxes everywhere but we are tackling them pretty quickly. For new years my mother in law made a large pot of menudo and we’ve been eating that since. 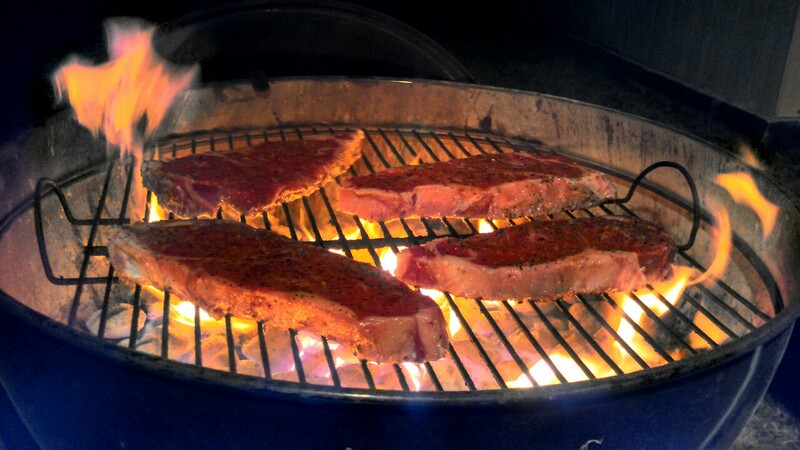 Craving for something else I decided to grill some steaks. I didn’t setup the Primo Oval XL yet but the Weber Kettle was front and center. Mighty fine way to end the night. Great steak dinner with Yukon gold mashed potatoes and delicious Barbera wine from the Jerome Winery. Happy New Year! !